The desired state of our three campuses is to become a world-class, Hawaiian culture-based education system that engages haumāna and their ‘ohana in a culturally rich, personalized educational journey. As a result, Kamehameha Schools graduates demonstrate character, perspectives, and competencies necessary for a thriving Lāhui. Kumu are here and committed to supporting you and your child. Keiki and ʻōpio are only as strong as their kahua. Kamehameha Schools’ educational leaders have identified four key tactics that will take our campuses from where we are today to our desired state of becoming a world-class, Hawaiian culture-based education system. Read more about these tactics in the Parent's Guide to the Campus Education Plan. 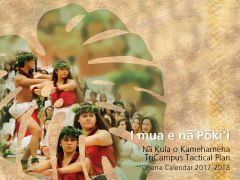 This calendar was created to serve as a guide through the Tri-Campus Tactical Plan. It includes E Ola!, Kamehameha’s learner outcomes, which are illustrated through a metaphor of a thriving Hawaiian forest, where our keiki, like the many different plants, birds and other animals thrive in a nurturing and dynamic community.